Whenever Christmas is around the corner, lots of us start getting really creative and want to do some fine and special “Christmassy” decorating. 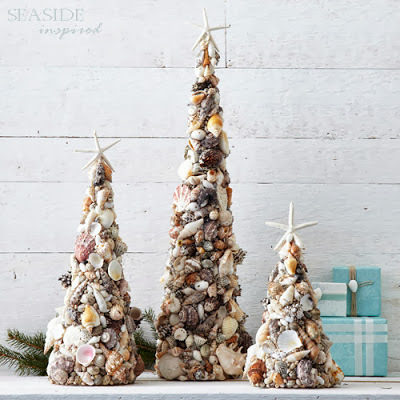 And as somebody who loves the beach and everything coastal, what could be more special than DIY Christmas Trees that you have made yourself from sea shells that have been washed ashore? 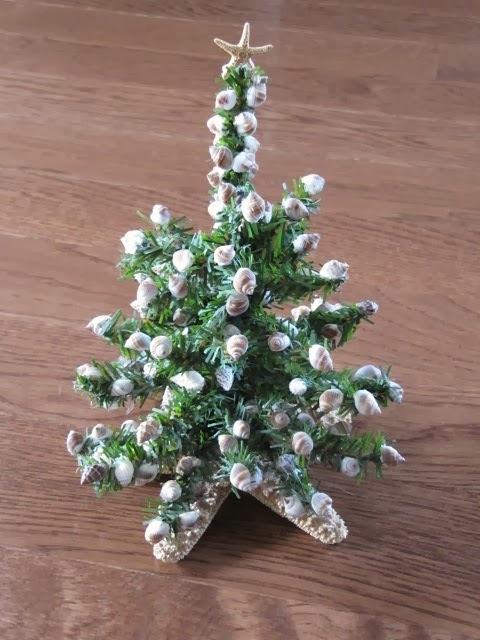 Here is a collection of gorgeous DIY Christmas Trees from sea shells to enjoy and possibly recreate! They are all stunning, and really quite clever ideas on how to transform those little treasures found on the beach into sparkling and festive ornaments that will decorate your house in a very special way on Christmas! If you don’t live near the beach and can’t collect sea shells, don’t despair! I am putting some links up on where you can buy some of the material to do these crafts yourself… some of these beautiful DIY Christmas Trees you can also simply buy and enjoy! 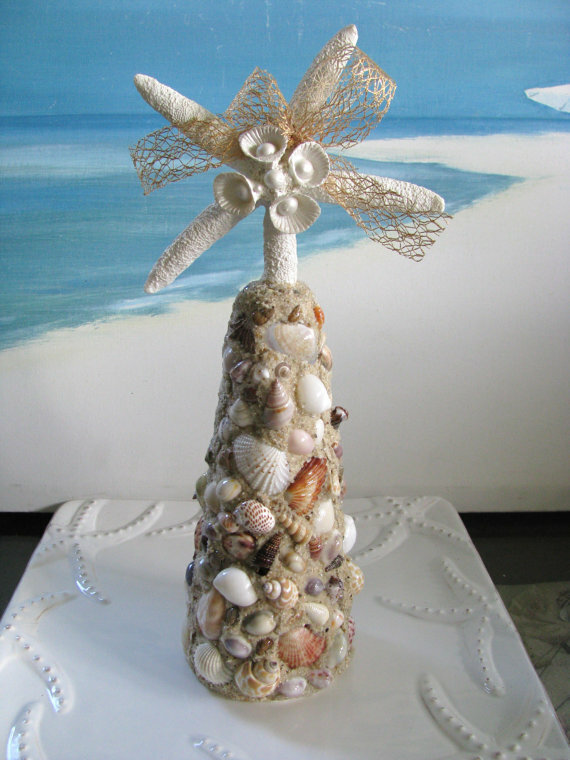 I discovered this endearing little Christmas tree on Sew Many Ways – its stand is a beautiful sea star, and the “baubles” are made from lots of small shells that have been hot glued all over the small tree. Also, the little sea star on the top is super cute! Or what about these beauties, made all from different sea shells glued onto cones. I think they look stunning, and finally there is a place where all the little sea shells we collect on our beach walks can be fully appreciated! Courtesy of Seaside Inspired. 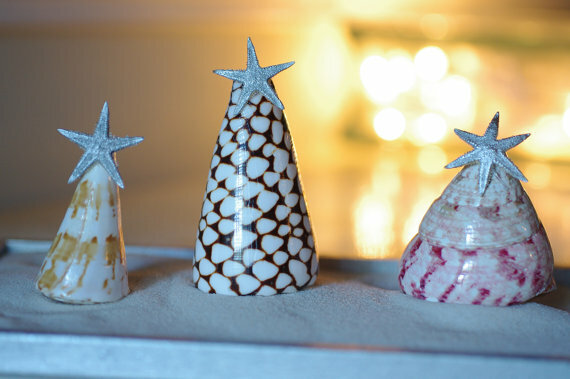 Now this festive trio of DIY Christmas Trees from sea shells can be ordered from By The Seashore Decor. They are hand made and come together with the wooden tray and the sand! Of course, if you do happen to have some cone shells like these in a big enough size, you can always get creative and recreate this special setup. This Christmas Tree is one of my favorites – I love that you can still see the sand between the shells. It looks so festive, it would be great as table top decoration at a wedding, too! From CeShore Treasures. This one is very special – it looks very elegant, like it is covered in snow, absolutely gorgous! It is all made from oyster shells. Design by MJL has only 1 in stock, so better be quick! 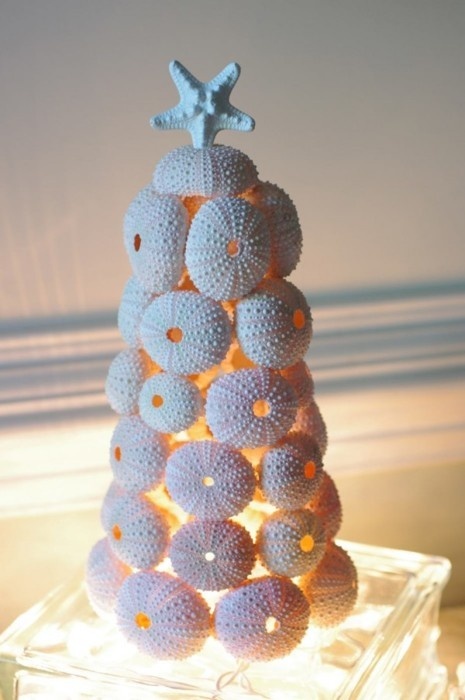 Last but not least, a DIY Christmas Tree made from lots of little sea urchins – seen on By The Seashore Decor. I love the idea with the light inside – obviously it would have to be a light bulb, not a candle, unless you want to see your artwork go up in flames LOL! I hope you have been inspired to go out and create a few Christmas Trees from sea shells yourself – or maybe, if you don’t have the time, to go and order some of the incredibly gorgeous trees you have seen here…. Happy DIY Christmas Tree decorating!